One after another, C. Richard Liu has achieved advancements and reaped accolades for pioneering work in industrial engineering, from manufacturing methods to breakthrough product designs. Now, the professor and associate head of industrial engineering’s graduate program at Purdue is marking similar successes in graduate study improvements and about-to-debut graduate programs. In 1980, he proposed a competitive strategy, separating design and manufacturing businesses in vertically integrated companies. “This allows component manufacturers to focus on fewer varieties and gain economies of scale,” Liu says. Now known as supply-chain-based manufacturing, it was first used by personal computer manufacturers in Taiwan and later by Boeing, Ford, General Motors, Hewlett-Packard, Dell, Delphi Automotive, Whirlpool, Cummins Engine Co. Inc., Caterpillar and others. “This structural change in manufacturing has been a game changer and led to a new area of research called supply-chain management,” Liu says. His research also led to the development of a new design for Whirlpool Corp. automatic washers, a dominant product the last 25 years. “Another more advanced new design proposed at that time has recently come to market,” he says. 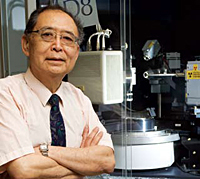 For his innovations, Liu received the prestigious William T. Ennor Manufacturing Technology Award from the American Society of Mechanical Engineers in 2008. One of the highest awards in the field, it salutes the intellectual, economic and social contributions of Liu’s work. As for enhancements to the industrial engineering graduate program, he has helped strengthen the PhD program, increase student funding and increase program productivity. A graduate of National Cheng Kung University, Liu earned a master’s at the University of Cincinnati and doctorate at Purdue. He joined Purdue’s faculty in 1978. To better prepare IE students to become future leaders, he’s now developing several new programs, including an undergraduate global exchange program that took him to China this summer. Other plans include a hybrid distance learning program, global BSIE/MBA and MSIE/MBA dual degrees, and a global leaders program for master’s students that would include an internship at a global company. All of the programs bring in cross-cultural experiences to complement industrial engineering, a reflection of Liu’s own life and desire to give Purdue students similar opportunities.